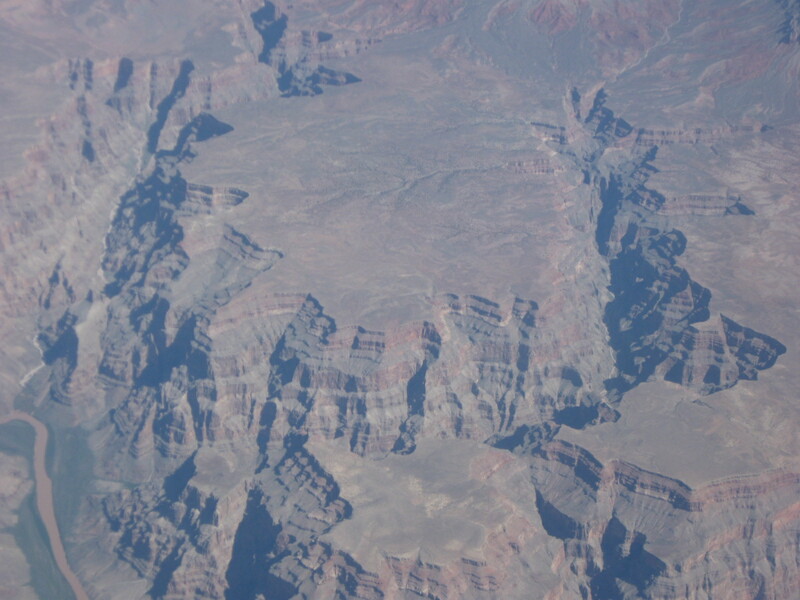 It's been almost two years now since I went to the Grand Canyon, but at the time I was so busy with my thesis that I never had a chance to organize my thoughts. 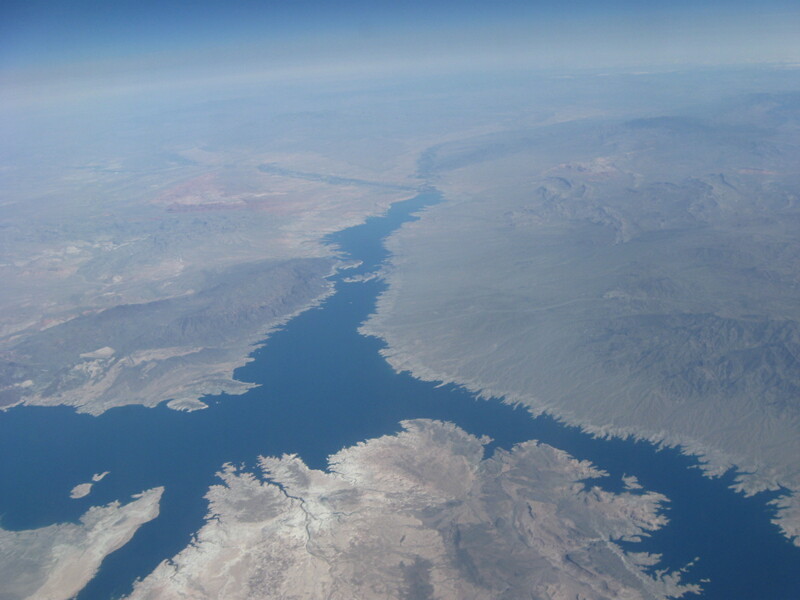 However, quite recently, I had the pleasure of this view when I was flying from Texas to California. (There are advantages to the window seat on an aircraft as well) and it triggered a string of overwhelming memories. 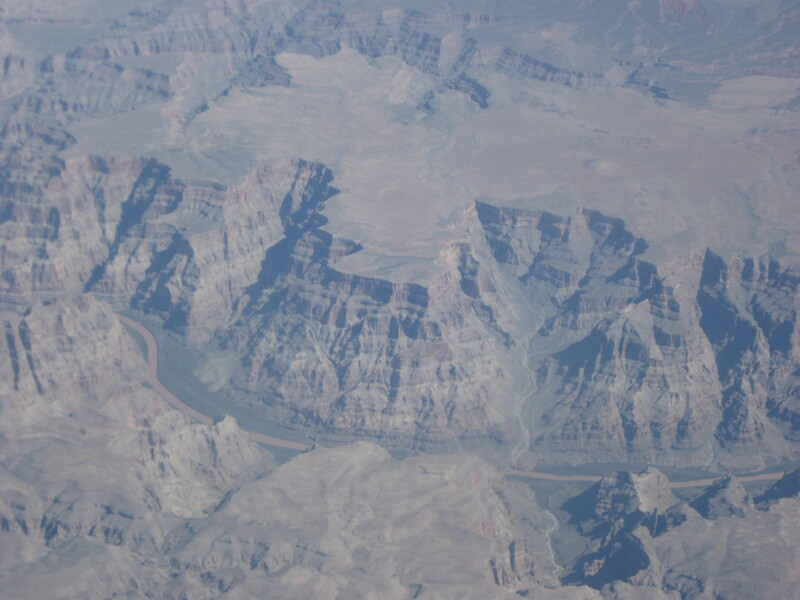 I remember having been extremely excited about the trip to Grand Canyon for a number of mixed reasons, it was going to be my last as a student, a month before graduation. It is one of the top tourist spots in the world. It was another wondrous complicity of Mother Nature. It is hard for me to say if the mountains and the river are rivals or each the best complement the other could have. The first view of the canyons after driving four hours from Phoenix is the one that hit me in the head the most. It wasn't a simple path that Colorado had paved through the mountains. With every bit of resistance, she changed her path and continued paving ...again and again..and again. That a single river could really achieve this in-spite of an overpowering obstacle...was overwhelming. It was close to dusk and we could not do much more than pitching our tents and cooking "bhutta" on the coal in our campfire. 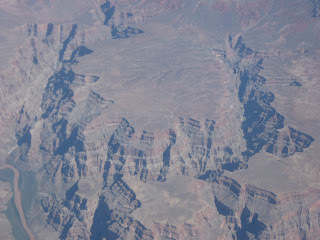 We started the next morning with a hike around the rim of the Grand Canyon and checking out the views and the geology. We were at an elevation of about 8000 ft above sea level and it never once occurred to us up there that it was the middle of the summer. The sunset was unusually disappointing because of the angle at which it sunk beyond the horizon at that time of the year. The sun hit the flat rim of the far canyon dispersing rays such that one could really see nothing much in that direction. By now, I was a little bored for the canyons looked pretty much the same from all around and I still was not tired as I should have been on a hiking trip. Well, the passing of the night brought a whole new day that made the trip unforgettable. We woke up at 330 am eager to catch the sunrise (scheduled at 430). If I had known that a sunrise would look just like a rewind of the sunset, I may not have made the effort. Nevertheless..it was beautiful. The dawn hue of the canyons was a sight to remember. We hiked back to our campsite which was a good two miles, met with others who hadn't made it and began our hike on the Bright Angel's trail by 730 am. This trail starts near the North rim, goes all the way down to the river, and comes back up on the south rim. This was only to be done over two days, and with at least two months of training. Since we only had a day, we decided to just go down a "little distance" and come back up. There were warning signs, scary stories and gruesome pictures everywhere that warned hikers that there were hundreds of people who needed to be rescued from the trail every year because of intense heat, dehydration, stroke, bleeding and also stories of some people who were found dead because they were delirious with heat and exhaustion, and had wandered off the trail and were lost for days. The warnings were a good thing because even with that we got carried away. What until now was a monotonous view, now turned into an ever-changing sight. The further we descended, the canyon walls rose higher and higher and engulfed us deceptively. We were going down all the time, and hence did not give much heed to how difficult it would be to come back up(In spite of clear signs all along that said" WHAT GOES DOWN MUST COME UP" ).The views got better...we passed through different rock layers, and it still was before noon. By the time we were 4.5 miles into the canyon, and the sun was beating down at close to 45deg C, we saw prudence in beginning our way up. It was getting hotter by the minute, and the ascent seemed ten times steeper than the descent. We had to go back up 4000 ft. It was one of the hardest things I had to do to keep on moving. I was beyond the point of having conversation for I had no strength to spare. At every 1.5 mile stop, there was water. I had little interest in drinking it, and gladly sat underneath the tap for five full minutes every time to let my body cool under the afternoon sun. I was doing much better when it was closer to sunset and we had less than two miles to climb back up. It takes 2-3 times more time to go up than climb down. Just as all good things come to an end, some hard things do as well. When we came out of the trail, the sun had begun to sink, but there were still a few odd people wandering, who turned to us and welcomed us with a cheer. We were smiling from ear to ear but were too exhausted and too parched to speak. We were also covered in dust from head to foot and could not wait to get under the shower. Well, there was one test still left for me. After taking the bus back to my campsite, I realized that I'd lost my friend's cell phone! So the shower had to wait. It did not matter that just two minutes before , I thought that I could not walk another step...I had to do my best to find it..Luckily after an hour of wandering and talking to people, I found the phone. Yes, Mohan, it is an experience of a lifetime, but one should choose the right season to do it. I want to do the whole thing again. Get a camping permit, camp by the river at night and come out on the south side..do the three day thing!